So, I know I said I wasn't going to let Christmas content seep onto here until December, but oops, it's early November and I just couldn't help myself. This week has been far less busy than the last, which I am more than grateful for. That being said, I haven't been to the gym as much as I'd have liked to and I still feel like I'm up to my eyeballs in assignments, but yanno, you win some you lose some. Ahh, Monday, a busy one as usual. I had my morning lecture, followed by a uni lunch date with my gal pals and then another lecture in the afternoon. I then went home and did a bit more work before heading back out to attend sign language. Last week we learnt family members and sexuality, so if you ever need someone to sign that your brother is gay or your auntie in law is straight, I'm here and happy to help. I don't have lectures on a Wednesday so my day is usually pretty empty. This week, however, I spent pretty much the entire day in a computer suite working on a group project that's due next week. We've definitely gone above and beyond what's needed and I'm really pleased with what we've designed. Welllll worth all the extra effort. I also received my results for one of the oral presentations I did last week and your girl only went and got a first, woop woop. Thursday saw me spend another few hours in a computer suite working on the aforementioned group project and another few in a lecture. I enjoy my Thursday afternoons - they're always really interesting. I spent the rest of the day catching up on uni work, scheduling blog posts and creating #ahomelychristmas... 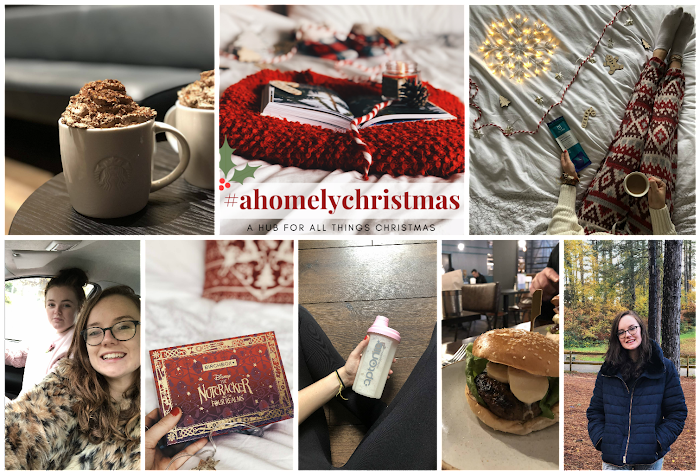 So, if you hadn't already heard, #ahomelychristmas is my new baby. It's an Instagram hashtag I've created that's going to act as a hub for alllll things Christmas. I'm thinking flatlays, food, decor, gift guides, outfits, the lot. 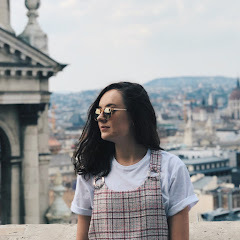 It's already got a few followers and there are four posts up already - I'd love it if you could check it out! After a busy few weeks, I was really pleased when Friday rolled around. I've spent this weekend at home-home, and so on Friday my Dad came to pick me up from Uni. In the afternoon, we went to Cafe Nero to sample our first Christmas drinks of the season - I had the winter spice hot chocolate. I also managed to rope my sister into helping me take some Instagram content, so that's pretty much the extent of my Friday. On Saturday morning I went to visit my Nannie and took her for her food shop. My sister's car is parked at her house until she passes her test, so we had a sit in it and turned the engine on for a bit. It's so weird to think that my LITTLE sister is 18 this year AND has a car of her own... In the afternoon my parents, sister and I all headed into town for lunch and some shopping. We went to Handmade Burger Company, and I'm gonna be honest, I wasn't suuuuper impressed. Having been blown away by Red Dog Saloon recently it just didn't meet my newly increased expectations. I then had my second festive drink - Starbucks' Salted Caramel Brownie Hot Chocolate, which, can I say, is delicious. I bought a dark brown hair dye whilst we were out so spent my evening having my hair dyed by my sister and I love it. I need to get more into the habit of keeping up with it because I really like how my hair looks dark even if I look a bit Casper the friendly ghost. Have you tried any of this year's festive hot drinks? I can't believe I've not had a festive hot drink from costa or starbucks yet, definitely need to get on that this week! Good luck with your deadlines lovely!